This exercise adds a balance challenge to the spinal articulation in an abdominal curl. Not only will you be strengthening the abdominal connection you will also be improving your balance. To do this exercise you will need a mat and a foam roller. Start by lying on the foam roller. Your spine will run along the length of the foam roller, and you will want both your pelvis and your head to be on the roller. Your knees will be bent and your feet will be on the mat in line with your pelvis. Place your hands behind your head and inhale allowing your ribs to expand. Exhale as you first nod your head and narrow your ribcage, and then allow your exhale to continue as you press your ribcage into the foam roller and lift your head, neck, and shoulders into the air. Inhale into the back of your ribcage, and then exhale again as you lower your head, neck, and shoulders to the ground. Repeat 8-10 times. As you work your way through this exercise you may notice that you might be wobbling a little bit. 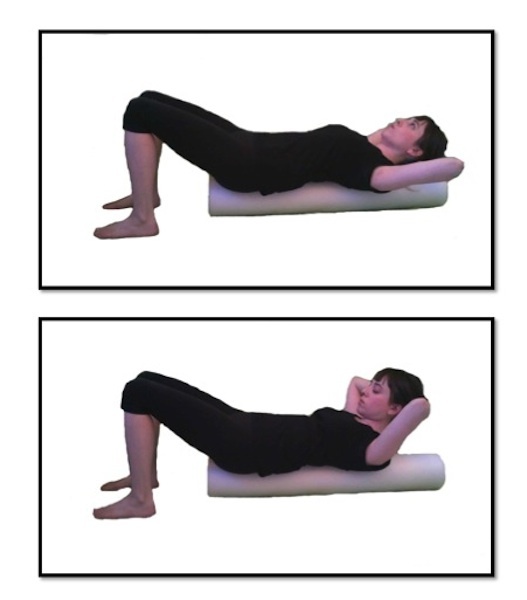 Due to the unstable base of the foam roller your body may have trouble balancing. Be sure that your feet are both on the ground and that you can feel your entire heel, your big toe knuckle, and your little toe knuckle, and the pads of all your toes reaching into the ground like the roots of a tree. These roots will allow you to find the midline of your body for support in balance. Be sure to support your head with your hands. The hands can help you articulate the first vertebra with the head nod. This will facilitate the spine articulation that will protect the muscles of the neck. Thank you for giving such a valuable information on spine surgery,This information is really helpful for my mother who is suffering from spine problems and will undergo spine surgery in india.